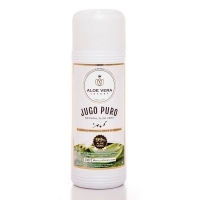 The Aloe Vera has the most powerful healing effect in nature and it has more than 75 nutritive substances for our body. Because of that, and many other reasons, this plant it is considered a “miracle plant”. It will help you to heal much faster any external or internal wound and it has so many vitamins, enzymes, amino acids, minerals, etc., that if you take a daily dose of 20 to 25 ml, you will benefit yourself from all its nutritional value. However, depending on the specific problem we want to treat, the daily quantity can be increased, up to 250 ml per day. In this case, our Fresh Aloe Vera Drink has a 99.8 % of fresh Aloe Vera crushed pulp, mixed with the minimum amount of natural preservatives (2 %), which can be able to stabilize the product and keep it fresh about 12 months. It has even little pulp pieces inside! 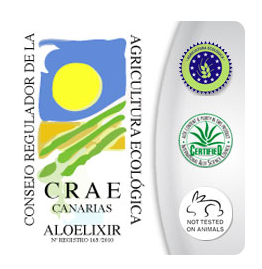 We produce every month new small amounts of fresh Aloe Vera crushed pulp, ensuring always the freshness of our products. It is one of the purest products that currently you can find. It has also a sanitary register number and comes pre-sealed and packaged in PET plastic. This special plastic is used for packing food, as it is known that other plastic packagings produce impurities that can contaminate the product in the course of time. Take daily from 20 to 25 ml (2 teaspoons), preferably on empty stomach, to benefit yourself from all its properties. Aloe Vera is a lily, so it shares family with garlics, onions and tulips. Consequently, the taste of the fresh pure crushed pulp may be a bit bitter. Further, the natural preservative is extracted from lemon, so the flavour may be slightly acid. Therefore, it is recommended to mix the daily dose of Aloe Vera crushed pulp with fruit juice, milk shake, honey or other liquid that helps to reduce the bitterness of the lily itself. Mixing Aloe Vera with other substances does not reduce its nutritional value. In cases of heartburn or acid reflux it is recommended to take a teaspoon of fresh Aloe Vera crushed pulp before every main meal; in order to reduce the acid levels produced by gastric juices, during and after the meal. In cases of psoriasis, constipation or during chemotherapy treatments, it is recommended to take 4-5 teaspoons daily. The fresh Aloe Vera crushed pulp can be daily ingested by people over 5 years old. In pregnant women, there are still doubts about whether they can take it or not. 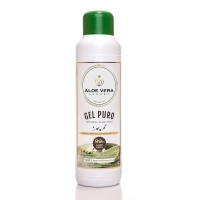 This product contains 99.8 % of fresh crushed pulp of Aloe Vera, extracted from its leaves, and pressed in cold, so it is recommended to store it in the fridge once opened, in order to avoid its early oxidation. After 6 months in the fridge, the colour of the juice will begin to turn yellow. This is the normal oxidation process of the plant, so you can continue using it until the product reaches 12 months or until it turns orange. 750ml PET plastic pre-sealed bottles.